I love getting email! Contact me at sarah@sarahjoya.com and I will get back to you. ... and our published Match.com Success Story! 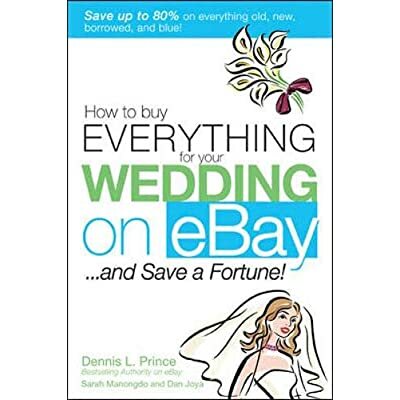 My co-authors are eBay expert Dennis L. Prince and my husband Dan Joya. I wrote the bulk of this book in 2004 with a tight 8-week deadline from McGraw-Hill, during our own wedding planning of our "big fat eBay wedding" and my4th year of optometry school. We wrote our stuff in Chicago, with our co-author in LA, and our editor in NY. What would we do without email and the Internet?? The book was published and released in 2005, one week before our bridal shower. I am interviewed on ABC7-Chicago 10 o'clock news to promote swap.com in a special TV segment called "Closet Currency." The video promo is about 15 seconds long, and the actual video runs about 3 minutes 35 seconds. You can read the full story here by Leah Hope. Enjoy! "Sarah Manongdo-Joya hasn't been shopping for books or DVDs for over a year since she found SwapTree.com (now swap.com). She offers up items she's ready to shed and makes a list of items she'd like. She packages up the item she doesn't want pays to mail it and in return gets something she actually wants. "It's like opening a present when you get it in the mail. It's like, oh I've been waiting for this book so it's really fun," said Manongdo-Joya." "How to Create Your Online Business Website for Free or Very Cheap! " My advice on how to create websites like mine...that are free or cost very little money. You can do it too! I ran my webstore in from 2007-2013 as an off-shoot of my successful eBay business as sarspinay. My website featured affordable silk flowers for centerpieces or hand-held bouquets, ideal for weddings, showers, corporate events, birthdays and more, all for less than $10 each. I graduated from Illinois College of Optometry in 2005 and have been working as an optometrist in a corporate setting where I practice primary care. 2) Article in "Women in Optometry" Sept 2009 issue Magazine: Pink Ink: "What It's Like On The Other Side"
3) Article in "Women in Optometry" August 2012 issue Magazine: Pink Ink: "In Search of Value"
I also wrote an article for Q1 2010 issue of Corporate Optometry Reports: "OD/Recruiter Shares Tips for Getting Noticed." At age 15 in November 1992, I drew my favorite Disney movies : Little Mermaid, Aladdin, and Beauty and the Beast (pencil drawings)! What's my next project going to be? Don't know yet but stay tuned!